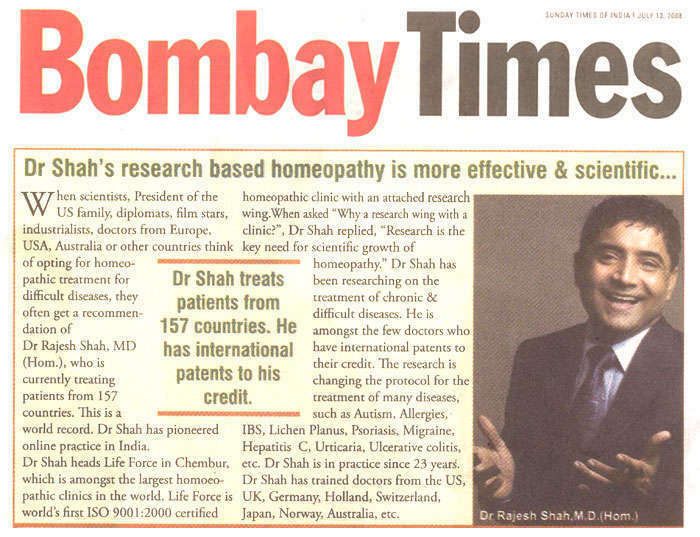 Dr. Shah heads Life Force in Chembur, which is amongst the largest homeopathic clinics in the world. Life Force is worlds first ISO 9001:2000 certified homeopathic clinic with an attached research wing. When asked why a research wing with a clinic?â€ Dr Shah replied, "Research is the key need of for scientific growth of homeopathy." Dr. Shah has been researching on the treatment of chronic & difficult diseases. He is amongst the few doctors who have international patents to their credit. The research is changing the protocol for the treatment of many diseases. He is amongst the few doctors who have international patents to their credit. The research is changing the protocol for the treatment of many diseases, such as Autism, Allergies, IBS, Lichen Planus, psoriasis, Migraine, Hepatitis C, Urticaria, Ulcerative Colitis, etc. Dr. Shah is in practice since 23 years. Dr. Shah has trained doctors from the US, UK, Germany, Holland, Switzerland, Japan, Norway, Australia, etc.